This multimedia tutorial provides explanations and models of wave diffraction. It contains multiple images, animations, and interactive simulations designed to represent what happens when a wave encounters an obstacle. The tutorial begins by explaining how the amount of diffraction depends on the wavelength and the size of the object being encountered. It progresses to discussions of various diffraction effects, Huygen's Principle, and concludes with diffraction through two slits (a simulation of Young's classic experiment). 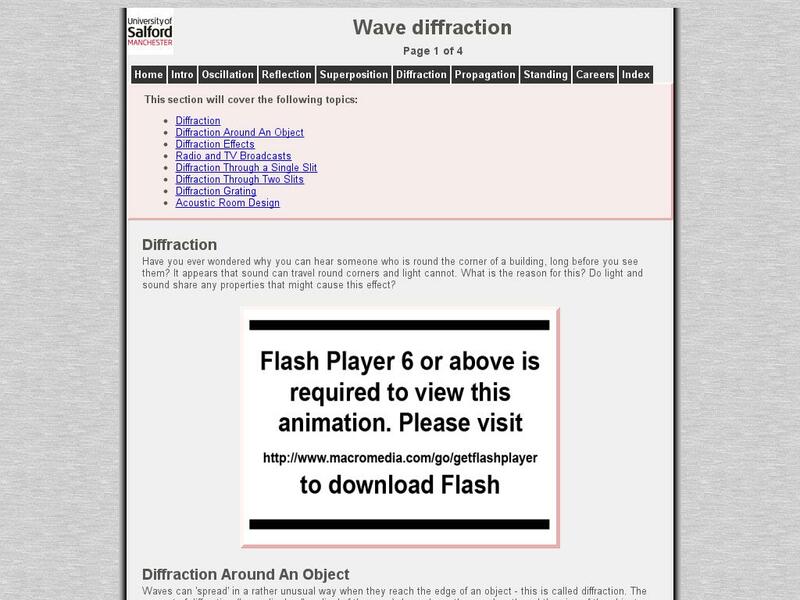 This resource is part of a larger collection of multimedia tutorials on waves and acoustics. It was developed specifically to help learners visualize how waves of varying wavelength will diffract in predictable ways, and how this behavior is related to practical applications, like radio/TV broadcasting and acoustics.